A barking puppy can drive owners and neighbors crazy. Barking can’t be totally eliminated as it is a natural behavior and a form of puppy communication, but you can teach your puppy to reduce barking. Puppy barking serves many purposes. Puppies bark when they play, to greet you (or another animal), or defend against scary or intimidating interlopers. Consider your puppy’s bark as a doggy alarm: it serves as a warning about anything unusual, interesting, or exciting, like a friend or stranger’s arrival, a sudden sound, or an unexpected sight. Rather than trying to fully eliminate the barks, figure out why the pup barks and teach him the difference between appropriate barks and problem barks. Provide consistent rules and responses. If your response to excited barking is sometimes positive and sometimes negative, your dog will get confused. Stick with the same response to the same behavior, and make sure other family members do the same. Be sure there are no physical or psychological issues causing the behavior. If your puppy is frightened, in pain, or feeling ill, it may well whine or bark. Be sure you've taken care of any environmental or health issues that could stand between your puppy and good behavior. Use appropriate techniques to train your puppy. Remember that your puppy is just a baby, and it only knows what you teach it. Avoid harsh discipline; praise and kindness can help your puppy grow up to be a loving, well-behaved dog. Don't let your emotions get in the way of training. If your puppy whines when it's left alone, you may feel you need to comfort it. When you do that, you teach the puppy that whining or barking is the best way to get attention. Once you've removed barriers to training, you should see good results. 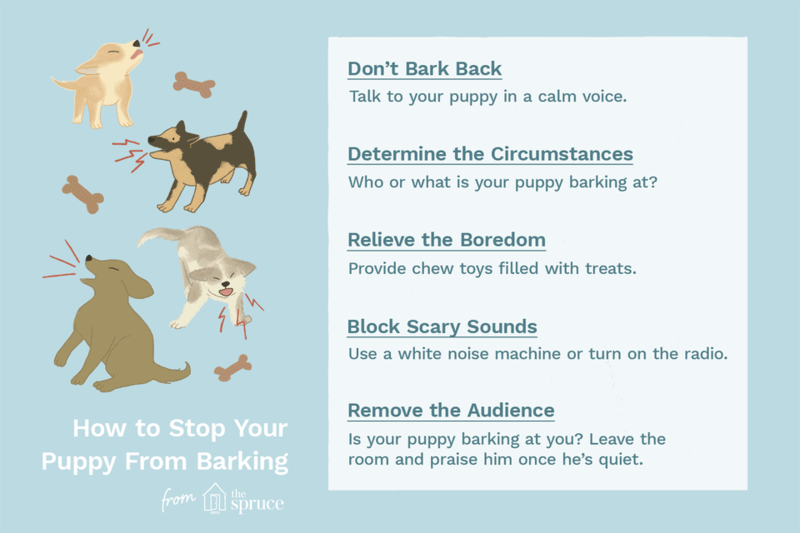 If you're still having trouble reducing the amount of barking you hear, however, these tips may help you troubleshoot the problem. Don’t bark back. When speaking with your puppy, the tone of voice and body language are just as important as the words you use. For some dogs, barking is a joyful expression. Use a calm voice when addressing your dog. Yelling can make it think you’re joining the chorus and bark even louder. Remove the audience. If your dog barks and you come running every time, you reward the behavior. Instead, thank it, then say, “Hush.” When your pup stops barking, praise it and offer a treat. If it keeps barking, turn your back and leave the room. Most dogs want company, so leaving tells your dog it is doing something wrong. Your dog will learn to be quiet if it wants you to stay. 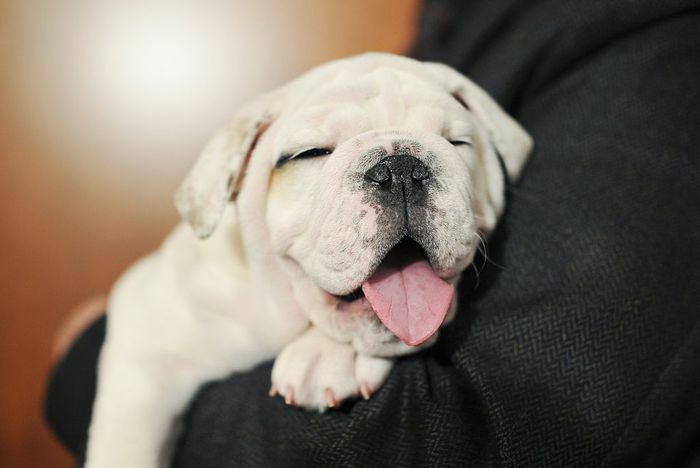 Give your puppy a “bark limit.” Designate a set amount of barks you will allow. For example, it's allowed to bark three or five times until you acknowledge the warning. Now your dog knows you can take over. After the designated number of barks, praise your puppy: “Good bark, Good dog, now hush,” and offer a treat as you praise. It’s hard for dogs to bark while chewing so the treat serves a dual purpose. Address situations that occur regularly. Barking at the mailman teaches pups to repeat the behavior over and over again. You may want to enlist your mail carrier’s help to eliminate the barking. Ask the postal carrier to feed your pup a treat once it is quiet and praise your pet for being silent. Provide door drills. Ringing the bell, knocking on the door, and arrivals or departures can excite or scare shy pups. Create an association of the door and door sounds with good things for the puppy. Stage arrivals at the front door with an accomplice “visitor” loaded up with treats to toss. This helps it to stop seeing visitors as threats. Relieve the boredom. Many pups bark because they’re lonely or bored. Even if the dog has nothing to bark about, talking to itself may be better than silence. Chew toys that reward the puppy’s attention with tasty treats also fill up the mouth—it can’t bark and chew at the same time. Puzzles and toys like the Kong Wobbler can be stuffed with peanut butter or kibble treats and must be manipulated to reach the edible prize. Block scary sounds. Inexperienced dogs hear lots of “new” sounds that may inspire barking. When barking arises from fear, the pheromone product Comfort Zone with D.A.P. may help relieve the angst. White noise machines are available to mask sounds, or simply turn the radio to a normal volume and tune it to static. Train with head halters. Tools such as Gentle Leader and Halti can work wonders for training dogs. Pulling on the lead gently presses the pup’s mouth shut for the few seconds of pressure and signals it to be quiet; you don’t have to say a word. The halters are available from pet products stores and veterinarians. Try a new tone. Tone collars emit a loud, short tone at the first “woof.” That’s often enough to make the pup stop and search for what caused the tone. It eliminates boredom and the barking, often within minutes. However, the collar must be adjusted properly or it can “punish” the wrong dog if a canine friend is barking nearby. Curb barks with scent. Researchers found citronella collars to be effective in bark training. Citronella collars give a warning tone first; additional barking prompts a squirt of scent that stops the barking. Some of these collars even have remote control activators. Because each pup is different, not all the techniques listed above work for every dog. Most training techniques require an investment of time and consistency. If you haven’t seen improvement in three to five days using one of the anti-bark techniques, try a different approach.